Imagine a place where there's a queen of all pancakes, a king of cookies and a pack of over-protective dragons. If this sounds like something out of a dream, it actually is! Sleeping Queens was invented by 6-year-old Miranda Evarts, who thought up the game one night when she couldn't fall asleep. She awoke the next morning and with help from her older sister, Madeleine and her parents, Denise and Max created this wonderfully whimsical world of napping nobles. As you immerse yourself in the Evarts's fantasyland, you will find a game that helps develop memory, strategy, and elementary arithmetic skills. Just be careful when playing potion cards or you could wind up putting all the players to sleep! I wrote this review for SLEEPING QUEENS from the perspective of a dad with two girls ages five and eight. 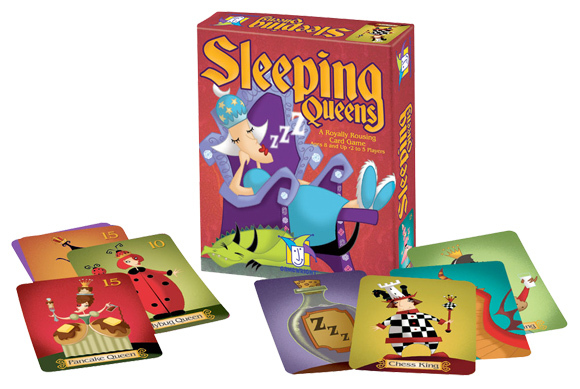 Sleeping Queens is a delightful card game designed for ages 8 and up and is clearly designed with kids in mind. We have weekly game nights as a family and I also run a cards and board game group for kids ages 7-8. We’ve probably played at least 20 matches so far so I feel like I know the game well and how it is received by it’s target market. This is first GameWright card game we have purchased and I hope this review helps you decide whether SQ is for you! The goal is to wake up the queens until one player has woken 4 (or five) queens. The game ends at that point and all players count up the point values of the queens they have woken. Highest point total wins! Some queens have special attributes, for example waking the Rose Queen allows you to immediately wake another queen! You set up the game by shuffling the 12 queen cards and placing them face down on the table. The standard size deck of cards is shuffled and 5 cards are dealt to each player. The remainder of the cards makes up the draw deck, which is placed in the center of the table. Players make one play per turn and draw back up to five cards at the end of their turn. Kings – if you play one of the king cards, that allows you to “wake up” a queen by turning one of the 12 queen cards over and placing it on the table in front of you. Knights – Playing a Knight card allows you to steal away a queen from another player. Dragons – This card is the defense card against the knights. You play this in response to someone trying to steal your queen to prevent it. Sleeping Potion – Playing this card allows you to put another players queen card back to sleep by turning it over and placing it in the middle of the table with the other queen cards. Magic Wand – Like the dragon card, a magic wand card defensively prevents a sleeping potion card from putting one of your queens back to sleep. Number Cards – Like regular deck of cards, SQ has 4 cards each of number 1-10. On your turn you may choose to discard a number card to draw a new card. Pairs, three and four-of-a-kind can be discarded to draw that many cards up as well. In addition (ha), you may create a fact family problem to draw three cards, i.e. 4+5=9 discard those 3 cards and draw 3 new ones. Jesters – Playing a Jester card is a bit of a gamble and allows you to flip the top card off the draw deck. If it is a picture card (knight, wand, etc) you can immediately wake up a queen! But, if its a number card, the player counts off around the table to that number starting which themselves. Whoever he ends up (and it could be himself) gets to wake up a queen. All of these cards are one time plays and are immediately discarded when used. Sleeping queens is just a card game so there are no other components besides the deck of cards. The art work is colorful and fun to look at. Each queen and king has their own theme and are dressed accordingly (Pancake Queen, Moon Queen, Puzzle King, Cookie King, etc.) The box is make of quality cardboard with a plastic tray insert to store the cards. Seeing immediately that the queen cards would be subject to the most handling and may become victims to scratches, nicks and bends, I decided to put those 12 cards in plastic card sleeves to prevent them from being inadvertently marked and tipping off players where the highest valued queens were. I’ll make no bones about it, Sleeping Queens is probably THE most requested game currently with my daughters and with the kids gaming group I run. It may be because it was the first “alternative” game I introduced to them, or it may be because of the simple but fun gameplay. Kids love choosing cards and denying other players from taking their queens! A game takes about 15 minutes to complete, which also makes it very easy to play a quick match. Those looking for a little more depth and strategy should probably look elsewhere. But for those with kids, I highly recommend picking this one up. Gamewright has many clever cards games designed with the kid market in mind but this one is probably the best bet for a first choice. Lastly, you can pick this game up on Amazon FOR ONLY 10 BUCKS! This game has EASILY paid for itself 5 times over and continues to do so. So WAKE UP and order a copy! Since Sleeping Queens showed up in our house, it’s gotten more playtime (by far) than anything else in our nightly family game rotation. It can be pretty difficult to find a game that can be equally engaging for both our boys (3 1/2 and 6 years old), but this game nails it. The mechanics are simple, and can be learned and taught just a few minutes. Our 3 1/2 year old can play his own hand without much help. He skips over some of the mathy bits, and still fully enjoys the game without feeling disadvantaged. The sweet spot for the game seems to be 5-9 (not surprising, since the idea came from the mind of a 6 year old). The small advantage you do get from puzzling out simple addition is a great motivator for kids to get their gears spinning and practice their math skills without having it feel like homework. The educational component is certainly there, but it’s subtle and well integrated into the fun. The ultimate outcome of the game depends heavily on luck-of-the-draw, but less so than other young-kid staples like Uno or Candyland. There’s a healthy dose of interesting decisions to be made, and many of them impact other players. These player/player interactions are a really key element of the game, and keep the kids engaged while others are taking their turns – another great trait when you are trying to keep an easily distracted 3 year old at the table. Games are fast – usually about 15 minutes. The random elements help balance out the game, so everyone’s got a shot at winning, right up until the end. We almost passed this game up because of the “Queen” theme, but I’m really glad we didn’t. Once you get past the box, the game is surprisingly gender-neurtral – with kings, knights and dragons balancing out the queen characters. The art in the game is high quality, and the silly characters really add to the fun. Everyone in the family has their own favorite king and queen (the Chess King is my personal fav), and sometimes we find ourselves making sub-optimal game decisions just to get our hands on a favorite cards. I wouldn’t say that this game has enough depth to stay on the shelf once the kids grow past the 10 or 11, but I’m always happy to play this whenever the kids ask – and that’s something I can’t honestly say for most other games targeting this age group. This is a great game to get the family to fall in love with quality gaming, and one of our top 3 family games. This game is simple to learn for young kids, and it teaches math skills in a very creative way! The whole game isn’t about math, so kids who may be leery of “educational math games” will have plenty of other fun aspects of this game to enjoy. There are cards numbered 1-10, and in order to accomplish other things in the game, sometimes it helps to be able to discard and redraw as many cards as possible on a turn. One of the ways to do that is to make math sentences out of your numbered cards. You can discard 3 or 4 or even 5 cards that add up and include the answer (such as discarding 1,2,5 & 8 because 1+2+5=8). This skill is a simple & brilliant way to help kids learn to be aware of number patterns and combinations. The artwork is also charming and funny, and it is delightful to know the game was invented by a 6 year old! My only complaint is, the cards were a little stiff and hard to shuffle in my poker-style way, but I guess that makes them more durable. 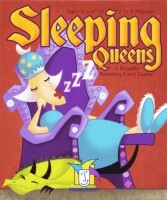 Sleeping Queens is a great add to your collection of card games for young children. Along with Rat-a-tat-cat, and Egyptian War, this is the most requested kids card game at my house. Game play is very simple – basically you play a card, then draw a card – but there is something about the quirky drawings and cards that capture kids attention and interest. It has also been nice to see my kids get better at the gentle (and quite optional) math element of the game – you can discard numbers that form an equation to get more cards and increase your chance of winning. Our daughters, ages 7 & 9 LOVE this game. Honestly, my husband and I thought it’d be just another card game for the family, but since we’ve opened it we’ve played for up to two hours, 3-4x’s a week! It’s a creative card game, using different character cards to wake the sleeping queens. Not a ton of strategy is involved, so it’s a quick game for younger children to learn, while being complex in utilizing math skills to get rid of number cards and replace them with face cards. My husband and the girls were playing with the straight rules, 50 points or 5 queens wins the game with 2-3 player. They recommend 40 points or 4 queens with 4 player. I suggested we play to 5 queens or 50 points to make it a little more challenging. We’ve all enjoyed the challenge more. Watch out, Uno! I think Sleeping Queens stole your thunder. Add a Review for "Sleeping Queens"